Predictive models for "Strategic & Tactic decisions"
This kind of predictive model is actually a more advanced form of churn model. The " " means "Average Customer life-time value" of all the customers inside the segment_s: this value must be given by the business analyst or the marketing team. ...where is the probability of churn in the next 3 months for the individual " ". This probability is computed using a predictive model (that is typically built with TIMi). The chart above contains 4 states (high-value-customers, medium-value-customers, low-value customers, churned customers). These states can be defined using business rules (that is the most "natural" way of doing it) or these states can be the results of an advanced segmentation created with Stardust. You must create a predictive model for each possible transition. This means that, in this simple case, there are already 8 predictive models to create (at least 5). In the chart above, not all possible transistions are illustrated. 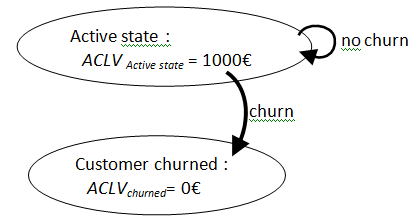 For example, for the , you must create a predictive model that estimate the probability that a customer inside the state "Medium-value-customer" switches to the state "Low-value-customer" in the next 3 months. As you can see, the creation of the whole system that is used to forecast the real CLV (3 months in advance) of a customer is a very time-consuming process because it involves creating many (many!) different models (one for each transition). Hopefully, with TIMi, creating a predictive model is quite fast. This is why TIMi is the preferred solution when building a system to predict the real CLV of a customer. Of course, the accuracy of the prediction of the CLV is only as good as the accuracy of the "individual predictive models" that are composing the CLV-prediction-system. Most of the time, these "individual predictive models" have already a very poor accuracy thus you should not expect a very accurate CLV prediction (especially when you are using any other datamining tool than TIMi to create the "individual predictive models"). Personally, I tend to see this whole "CLV estimation system" as a commercial joke. Datamining vendors are always searching to add new functionalities inside their tool instead of improving the functionalities already provided. Indeed, it?s very difficult to improve prediction accuracy (i.e. to obtain a higher lift on the TEST SET) and it?s a lot easier to provide a new (barely working) functionality like this "CLV estimation system". Test the TIMi Suite for Free!